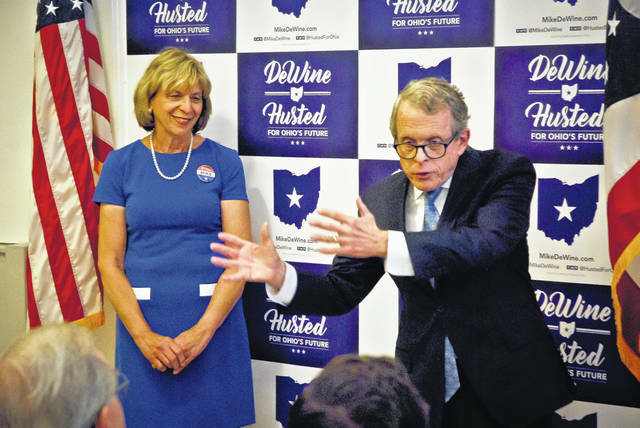 Gubernatorial candidate Mike DeWine (R) and his wife, Fran, stopped at the Delaware Republican Party Headquarters Monday for the Rock Solid Conservative Tour. DeWine thanked local GOPs for their efforts as he seeks the Republican nomination for Ohio governor. Ohio Attorney General Mike DeWine (R) and his wife, Fran, made a last-minute campaign stop at the Delaware Republican Party Headquarters Monday in downtown Delaware as part of DeWine’s Rock Solid Conservative Tour. “Delaware is an important county in the primary and the general election,” DeWine said after he and his wife were introduced by Tina Husted, Ohio Secretary of State Jon Husted’s wife. DeWine and Ohio Lt. Gov. Mary Taylor are each vying for the Republican nomination for Ohio governor in today’s primary election. DeWine said Jon Husted, his running mate, was in northwest Ohio when they last talked Monday morning. He said the good thing about having a great running mate is that the two of them could split up, with one covering one part of the state, while the other covers another part. DeWine’s special guest, State Rep. Robert Sprague, candidate for Ohio treasurer, gave some brief comments in which he said the issue of heroin addiction is something he and DeWine agree on. DeWine said that he had gotten to know Sprague over the opioid issue. DeWine said that it’s one thing to talk about being a conservative and about being pro-life, but that it is something else to have gone out and worked for it. DeWine said the one thing that he has always done throughout his career is to bring people together to solve and deal with the state’s problems. DeWine said he thought the spotlight is coming back to the heartland. DeWine said the two biggest challenges the state faces has to do with education. He said the first was the gaps in the skill level and education. The other challenge is the drug problem. This entry was tagged D. Anthony Botkin, Fran DeWine, Jon Husted, Mike DeWine, Tina Husted. Bookmark the permalink.